As technology upends grid fundamentals, is load forecasting a crapshoot? Each year, electricity consumers in the United States spend billions more than necessary to keep the lights on, in large part because the utility sector has been overestimating its needs. For decades, the United States saw its demand for electricity rise at steep and steady rates. From the 1950s through the 70s, the U.S. Energy Information Administration (EIA) says demand often increased by more than 5% — faster than the economy grew. In the 1980s and 90s, growth slowed but still ticked along at 2% to 3% annually. Since then, however, much has changed. Technology has advanced, the country came through the Great Recession from 2007 to 2009 and power markets have been restructured. Electricity demand growth has fallen to less than 1%, and some regional transmission operators are predicting declining loads. Last year, retail electricity sales in the United States fell by 80 billion kWh according to the EIA — the largest drop since the economic recession in 2009, and represented retail sales in the residential, commercial and industrial sectors. Despite this, new resources continue to be built. Analysis from the Rocky Mountain Institute (RMI) last year concluded load predictions have consistently over-forecast by 1% each year. That means a decade-out planning strategy results in a 10% over-estimation of demand, leading to billions of dollars in unneeded investment. Mark Dyson, a principal with RMI’s electricity practice, says the United States has 40 GW of excess capacity, above and beyond reserve margins — a result of resistance to changing how load forecasting is done. Batteries and renewables take less time to deploy, say a year or two, compared with longer construction timelines for a new thermal plant. “Those would seem to be an effective strategy, especially in the near-term, to avoid making big bets in this era of growing uncertainty about how much load is actually going to show up,” Dyson said. Several factors have complicated the picture, with some coming to bear significantly as the United States recovered from its most recent recession. The rebound in electricity sales following that recession failed to meet expectations because, at the same time, advances in energy efficiency and distributed resources hit the market with real effect. “Utilities are faced with structural changes the forecasting people have never seen, with all of the transformation going on in the industry,” Seiden said. Simply put, and to misquote Warren Zevon, the econometric models which used to work, well, they won’t work now. 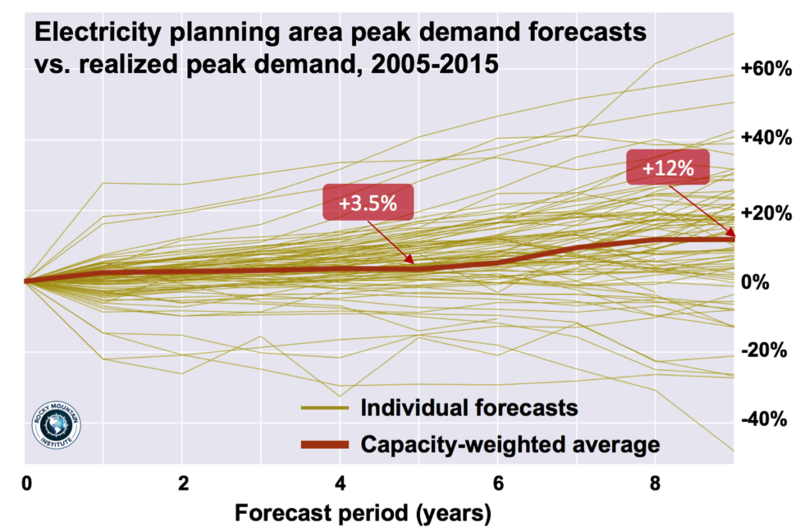 Seiden’s paper calls for a “more comprehensive approach to load forecasting,” and a shift away from the econometric models that have been used to forecast electricity demand for almost 50 years. Econometric modeling examines past growth and then forecasts that into the future, but Seiden said the approach no longer works because of structural changes in recent years. “It can’t be done that way anymore, in my opinion. You have to forecast the components,” he said, describing a “bottom-up, micro-oriented” approach. That means individually examining distributed solar, behind-the-meter storage, advances in energy efficiency, electric vehicle adoption and other factors, in order to develop more accurate forecasts. All of these factors are now impacting utility loads — mostly lowering them, with electrification of transportation expected to reverse that trend. A new analysis by the National Renewable Energy Laboratory predicts steady growth across the next three decades — largely driven by the adoption of electric vehicles. Broad electrification efforts could lead to a sustained absolute growth of 80 terawatt-hours per year, the report concluded. The demand will represent an entirely new opportunity for utilities, but also highlights the challenges of new technology. “A fundamental requirement for using an econometric-based model moving forward is that you don’t have structural changes and that’s precisely what we have going on in the industry right now — enormous technological and structural changes,” Seiden said. Tom Falin, Director of Resource Adequacy Planning for PJM Interconnection, points to yet another factor complicating forecasts: the United States’ evolution from a manufacturing-focused economy to a service sector economy. Last year, ISO New England issued a long-term plan that concluded the rise of solar resources along with energy efficiency advances would lead to a 10-year downturn in load growth and summer peak demand. The grid operator forecast total annual use of electric energy declining by 0.6% per year, with the summer peak declining 0.1% annually by 2026 under normal weather conditions. Similarly, New York ISO in May concluded demand on its bulk power system will fall over the next decade at a rate of 0.14% per year. Peak demand will decline as well, though slightly less, at a pace of 0.13% per year through 2028. PJM is still projecting some peak load growth, though it is slight: about 0.3% to 0.4% annually for the next 10 years. And Falin said those estimates are based on newer models that are designed to take into account structural changes in the electric industry and uncertainty over customer-sited resources. Efficiency and distributed solar are helping to reduce loads, but “to PJM, that’s all behind the meter, so we don’t necessarily have a great handle on how much of it is out there,” said Falin. “But in 2015, PJM recognized a lot of these fundamental changes so we did make several enhancements to our load forecast model I think has increased the accuracy,” he told Utility Dive. The grid operator introduced an explicit variable to account for energy efficiency, based on EIA estimates. And for behind-the-meter solar, PJM estimates how much is included in historical loads and then backs out that generation. While the five-year reliability view in PJM is broadly based on the time it would take to develop a new gas-fired power facility, newer technologies can allow for more flexibility, though Falin says there is no talk yet of reconsidering planning horizons. Some of the ability to do that — continue to alter resource plans — comes from the shorter time necessary to roll out solar, storage or demand management strategies. EPRI Vice President of Integrated Grid R&D Mark McGranaghan told Utility Dive there is a growing need for forecasts to be more localized because they are a part of utilities’ hosting capacity analysis and decisions about distribution system investment. Load forecasts are used in utilities’ hosting capacity analysis, which includes its ability to integrate more solar generation, the need for investment in the transmission and distribution systems and the desire to incorporate non-wire alternatives into those investments. “All of those factors depend on more accurate forecasts that are very localized,” McGranaghan said. In many areas, said Kellison, distributed resources will represent a ceiling for the potential costs of power.